Sit down comfortably in a quiet place with your spine straight. Close your eyes and focus your attention on the tip of your nose, looking slightly downwards with your eyes shut. Notice the breath going in, and then out, through your nose. Keep your awareness on your breaths all the way through without interruption, if possible. If a thought comes, simply take yourself back to your breathing. Don’t consciously try to change the length of your breaths, or anything else. Instead, just really notice the feeling of your breath. Start with 2–3 breaths, two or three times during the day, or whenever you think about it. Every breath you take mindfully is helpful, and you can gradually build up the time and focus on the different aspects of your life, benefiting your body, feelings, mind and heart. Breathe in, as described, while saying to yourself: “Breathing in, I am aware of my whole body.” As you breathe out say: “Breathing out, I am aware of my whole body.” Continue the process for a few breaths, noticing tensions and feelings in your body, and letting them go. Feel your body relax and surrender to the breath, the life-giving oxygen entering your blood-stream, reaching every part of your body, every atom, then leaving your body replenished, healed, and strengthened. As you breathe, say to yourself: “Breathing in, I am aware of how I am feeling now. Breathing out, I am aware of how I am feeling now.” Really open yourself to the feeling, whether it is pleasant, or not. Remember, you are just being aware of it, being “mindful” of it, just as you were mindful of your body. You are not judging it or trying to fix it. You are simply observing it, noticing it, allowing it to be. When you have had enough, take another mindfulness breath or two, perhaps feeling the breath go right through your body, healing, nurturing and protecting you. Take one or two mindfulness breaths as you repeat the words. Then allow yourself to get a sense of what is going on in your mind. How does your mind feel? Restless? Confused? Damped down? Worried? Wanting something? Whatever is going on, let it be, without judgement. Keep breathing, noticing, accepting, allowing. Feel the peace. As you practise breathing regularly, you will realise that you can find freedom from aches and pain, difficult feelings and troublesome thoughts, even if only for a moment or two. You may begin to experience what the Buddha called the “clear mind” – a place of space and clarity within, like a clear lake. You will learn to let your breath take you there any time, any place, and you will know true freedom. 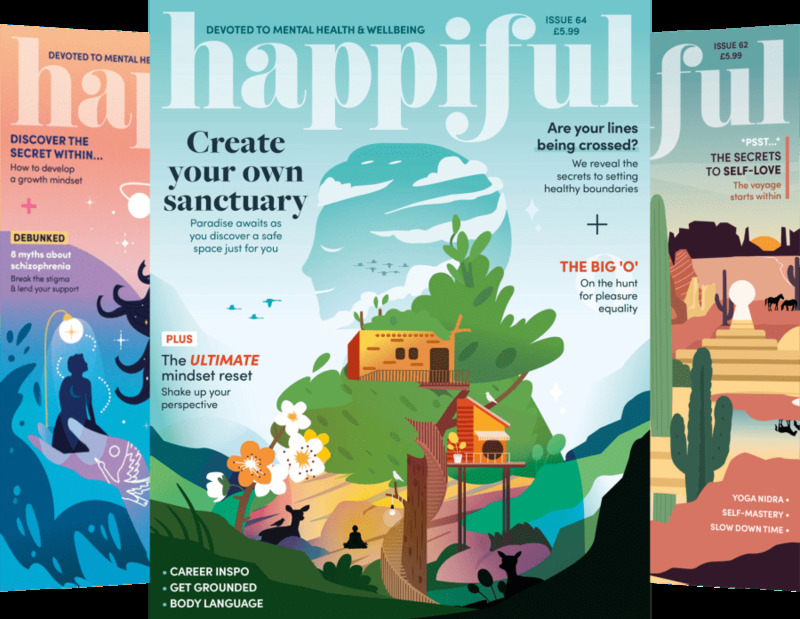 Rose is a contributor to the November issue of Happiful.